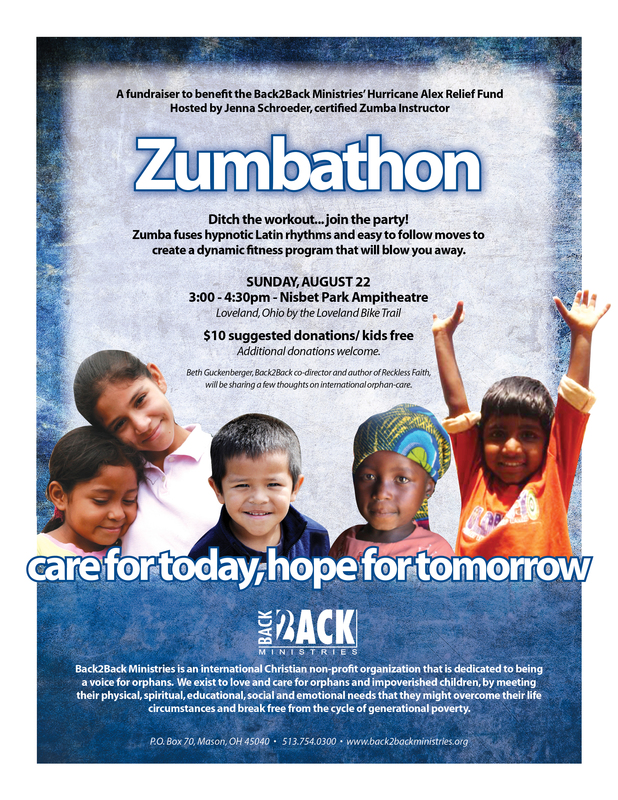 Join us for a Zumbathon! Cincinnati Friends: Join us on Sunday, August 22nd at 3pm for a Zumbathon fundraiser at the Nisbet Park (amphitheater) by the Loveland bike trail. Bring your friends and family to this fun Latin-inspired workout, led by certified Zumba instructor, Jenna Schroeder. Special guest speaker, Beth Guckenberger, will share a few thoughts on orphan care. $10 suggested donation (children can attend for free). The Back2Back Ministries blog is a forum for discussing faith and ministry, based on Judeo-Christian values. Back2Back reserves the right to remove any comments on the Back2Back blog that it believes violates the spirit of these guidelines. Examples of inappropriate blogs and replies that are prohibited on the Back2Back blog include but are not limited to copyright infringement, libel, hate speech, personal attacks or threats. Back2Back monitors comments posted on our blog, but has no control over the content of other Wordpress blogs you may access by clicking on our tags. Back2Back does not necessarily share or endorse the views expressed by other Wordpress blog authors.